An unstoppable force on piano since his emergence in the mid-'90s, Brad Mehldau has raised the bar for instrumentalists across the board, collaborating with the likes of Jon Brion, Pat Metheny, Chris Thile and most recently drummer Mark Guiliana on the electronic jazz feast Taming the Dragon (Nonesuch). At the Village Vanguard (May 6-11) Mehldau returns to the source of it all with his acoustic trio featuring bassist Larry Grenadier and drummer Jeff Ballard. The band's 2012 Nonesuch efforts Ode and Where Do You Start, focusing on originals and covers respectively, spill over with harmonic invention and interpretive finesse. Relix Magazine Reviews "Taming the Dragon"
Mehliana: Taming the Dragon is now available on vinyl from Nonesuch. 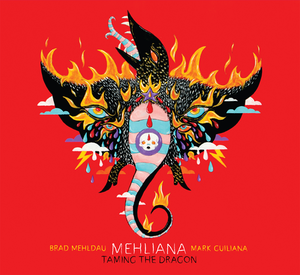 Mehliana: Taming the Dragon, the debut album from the electric duo of Brad Mehldau and Mark Guiliana, released late last month on CD and digitally on Nonesuch Records, is now available on vinyl. 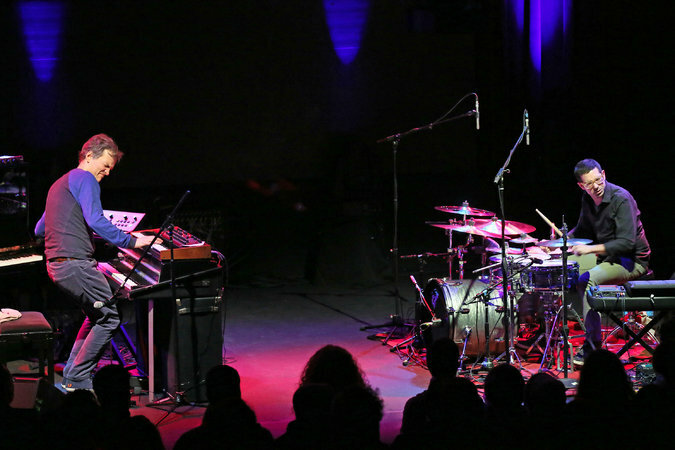 Mehldau and Guiliana have been performing for several years, with Mehldau playing Fender Rhodes and synthesizers and Guiliana on drums and effects, as they are on the record. Mehliana comprises 12 original tunes—six written by the duo and six written by Mehldau—and was engineered and mixed by Greg Koller (Jon Brion, Kanye West). The vinyl edition of the album includes two 140-gram LPs pressed at Pallas MFG in Diepholz, Germany, and a CD of the album; Nonesuch Store orders include a download of the complete album at checkout. Following its CD release, Mehliana: Taming the Dragon was described as "astonishing" by Jazzwise magazine, "one of the best albums of 2014." It earned four stars from the Guardian and from MusicOMH, which calls it "wholly absorbing ... an intuitive, compelling dialogue between the two musicians." Brad's new album project with drummer Mark Guiliana, "Mehliana – Taming the Tiger" is receiving outstanding reviews from a variety of music publications. Following are excerpts and links to complete articles. Pianist Brad Mehldau takes power off with the drummer Mark Guiliana. What is the tamed dragon here? The electricit . Brad Mehldau, the undisputed master of modern piano, as influential as was the Bill Evans, one day should pass electricity – Fender Rhodes, Moog synthesizer – it was not foreseeable. Yet listening to Taming the dragon, one is struck by a sense of obvious necessity. It seems that the duo Mehldau form with drummer Mark Guiliana plays hard, for some. The advantage of the disc is to set oneself noise. However, we recommend to listen too low. This is music that is full of vital energy: the opening, Taming the dragon piece, gives the feeling of a solar flare. Brad Mehldau is no longer anything the fertile young man emotions: it is a mature man who approaches music as a warrior, a samurai, decided to victory. Luxury continues in the same vein, with intransigence decision without pardon. Phrases keyboardist are all fireworks, looking less seduction (never a prettiness) the material ecstasy. You can not go back now, ironic title because the song starts with piano chords, get in electrical depths of what we stir bloods and moods. Mark Guiliana, which had been relatively conventional in the trio of Avishai Cohen, strives here to give a human resonance loops of rhythm machine, with a share of madness that makes this duo a staggering originality. Indeed, since Weather Report, had not heard of electric jazz as impressive. We listen to the fourth beach, The Dreamer (which still means the melodic inspiration Brad pianist), and we know that this writing duo intrepidity a page of history. Amidst all the heat and jagged angularity, there are still moments of beauty to be found. "The Dreamer," another collaborative composition, is driven by processed acoustic piano, a searing synth line and electronically processed percussion, but at its core it's a ballad—even one that Mehldau could easily transfer to his acoustic trio to demonstrate an inner funky bad self that rarely surfaces in that context—albeit one that concludes with more spoken word that links into the story of the title track as an assessment of dreams and the dreamer who dreams them. Even by Mehldau’s own standards, Mehliana: Taming the Dragon is a bold move, and one that may surprise, even alarm devoted followers of his acoustic playing. Teaming up with trail-blazing percussionist Mark Guiliana, Mehldau lays his talented hands on an array of electric keyboards, including the gorgeous Fender Rhodes, a prepared upright piano, and a winking bank of old-school 1970s synths. Rarely do both hands play the same keyboard at any given moment. And rarely has new music sounded so damned exciting. There’s a sense, though, if you put those surface arguments aside, that Mehldau has finally found a space where he can challenge himself — having so firmly established his own voice, his own style, even his own tics, in straight-ahead circles. Within Guiliana’s taut, propulsive cadences, Mehliana: Taming the Dragon uncovers the humor in his playing again, the impish creativity — successfully dynamiting, along the way, what had typically become a why-so-serious demeanor. And it makes those rare moments of relative stillness, those times (as on the gorgeous “Dreamer”) when Mehldau’s more familiar piano figures move to the fore, all the more revelatory in their stark beauty. Brad Mehldau, master of slow-burning, classically inflected acoustic piano improv, gets down and dirty with Mehliana, the electronics duo he shares with jazz, hip-hop and drum'n'bass percussionist Mark Guiliana. Their debut effort is entitled, "Taming the Dragon", a collection of some of their best forays that will be familiar to fans of their live shows, as well as some material not heard or seen live. Mehliana's use of vintage synthesizers, and their incredible grasp of both jazz and modern electronica is a joy to witness live, (They performed at both SF Jazz and the Independant recently); happily, their new album captures those moments and more. Taming The Dragon is also wholly absorbing, as Mehldau’s playfulness and Guiliana’s taut, interwoven grooves create an inescapable tension. Pieces such as the delightful, slow building Hungry Ghost even seem to draw from the approaches of post rock acts such asSigur Rós or Tortoise. The use of sampled voices and stories (narrated by Mehldau himself in a delightfully dry tone) serve to enhance the mysterious atmosphere. Brad's upcoming album with Mark Guiliana, Mehliana: Taming The Dragon, is featured on the cover of this month's Jazz Magazine Jazzman in France. The cover story features an in-depth article about the album, due February 25 on Nonesuch. Brad spoke with BBC Radio 3's Jazz line-up about his forthcoming album with Mark Guiliana, Mehliana: Taming the Dragon. Listen to the interview with Claire Martin and exclusive album tracks, starting at 47 minutes in. Brad Mehldau & Mark Guiliana’s tune "You Can’t Go Back Now," off their forthcoming Nonesuch Records album, Mehliana: Taming the Dragon, was featured on Mary Anne Hobbs' BBC Radio 6 Music Recommends show. Listen to it here, starting at 22:20. Brad's excited to play at the uptown New York City jazz club, Smoke, twice in the next few weeks. This coming Sunday and Monday, Feb. 9 and 10, Brad will appear with the stellar guitarist and long time compatriot, Peter Bernstein. On Feb. 12, Wednesday, Brad will appear with the enchanting singer, Fleurine. On all those nights, there are two sets at 7 and 9. Brad Mehldau & Mark Guiliana’s tune “London Gloaming,” off their forthcoming Nonesuch Records album, Mehliana: Taming the Dragon, was given an exclusive play on BBC Radio 2’s Jamie Cullum show last night. Listen to it here, starting at 40:40, plus a preview of Jamie's interview with Brad, which will air Feb 25. Brad Mehldau, the casually graceful post-bop pianist, and Mark Guiliana, the gracefully casual deep-groove drummer, faced each other across the stage at the Highline Ballroom on Wednesday night, as if to give shape to the idea of back-and-forth exchange. Things didn’t shake out that neatly or equitably. But the duo, which goes by Mehliana, delivered a credible mash-up of sensibilities in the show, an experiment in the emerging field of beat science and a treatise on the ageless art of tension and release. The show had been timed to coincide with the release of Mehliana’s debut, “Taming the Dragon” (Nonesuch), but a production issue pushed the album’s arrival back to Feb. 25. For what it’s worth, the agreeably slick production values on the studio recording — including a couple of spoken-word overlays by Mr. Mehldau involving dream logic and the dark insights of the subconscious — were barely a factor in the show, which felt more rugged and spontaneous, more like a developing story. Music Theory Online Essay on Brad Mehldau's Cover of Radiohead's "Paranoid Android"
ABSTRACT: This paper explores the intertextual relationships between popular music songs and their jazz adaptations, or “covers.” In a jazz adaptation of a pop song, the improvisatory section—wedged between two more or less complete statements of the pop song—forms the crux of the jazz performance. Improvisation affords musicians an opportunity to create something new out of an existing musical work and, as I suggest in this paper, has the potential to transform the expression perceived in the popular song’s lyrics and musical structure. Using Brad Mehldau’s live solo piano performance of Radiohead’s “Paranoid Android” (1997) from his promotional album Deregulating Jazz ( 2000) as a case in point, I show how his adaptation both highlights the motivic repetitions in the original rock song and heightens the song’s expressions of anxiety and apprehension. Mehliana: Taming the Dragon, the debut album from the electric duo of Brad Mehldau and Mark Guiliana, due February 25 on Nonesuch Records, and Kin (←→), the debut album from the Pat Metheny Unity Group, due February 4, are featured on the latest episode of BBC Radio 2's Jamie Cullum show. The episode looks ahead to the music of 2014 and showcases "some of the most exciting tracks coming out in the next few months in the world of jazz," including "Hungry Ghost" from the Mehliana album and "Kqu" from Kin (←→). "The pianist Brad Mehldau is probably my most played artist on this very show; I'm a huge fan of his," says Cullum. "Brad's always doing interesting left turns with his music." On the forthcoming album, "he's paying keyboards, he's playing Fender Rhodes, and he's playing with a very different type of drummer, Mark Guiliana, an incredible jazz drummer, but also someone who's got his ear open for new sounds, the sound of electronic music, the sound of dub step and hip hop and sample music and all that kind of stuff. He manages to bring that together with Brad's incredible conception on keyboard and Brad bringing together a load of new sounds as well, playing synthesizers, playing electric piano, and doing something totally new. Sounds great. You're gonna love it, I'm sure." The National Concert Hall of Dublin is a long way from the bars and clubs of Greenwich Village, New York, where pianist Brad Mehldau cut his teeth in the early 1990s. Originally built for the Dublin International Exhibition of 1865 this impressive edifice is the home of classical music in Ireland. The venue says much, not only about Mehldau’s status, but about jazz’s credentials as an art form—at the very top end of the scale at least. The concert had all the trappings of a classical recital too, from the magnificent Steinway piano—almost dwarfed by the towering organ that dominates the auditorium—to the well-heeled audience. Mehldau's mute arrival and departure, his playing without introducing the songs and his courtly bows to the audience belonged more to the classical world than jazz. In fact, Mehldau's casual attire seemed slightly incongruous in an atmosphere where the coughers felt like rude intruders. The ballad of Brad Mehldau is one with many verses. Over the years, this gifted player has spent time in action on many fronts. There was the early spell as the able foil for Joshua Redman, before he decided to recruit his own trio and knock down some doors. Then, there have been the occasions when Mehldau has left his trio at the station and swung hard for spells with guitarist Pat Metheny, drummer Mark Guiliana or bluegrass mandolin maestro Chris Thile. But of all Mehldau’s turns, it’s those times when he goes to work solo at the piano that are the most revealing and rewarding for many listeners. There’s a line of dramatic, striking and elegant beauty in the bare-bones setting. The lights go down, a hush falls over the stalls and Mehldau starts to weave and coax and tease some intricate magic from the notes and the spaces between. Some of his audience began heckling the American piano star Brad Mehldau (“Play some piano! Play a solo!”) during his untypically funky electric set with drummer Mark Guiliana. As the duo Mehliana, the pair were stirring the new brew of improv, 1970s dance-funk, and drum’n‘bass with which they’ve enthused club audiences this year. It enthused most of this London jazz festival audience, too, though clearly not all of Mehldau’s longer-term acoustic-jazz admirers. The barrackers hung on until the encore, only beating a slow retreat when Mehldau responded by turning up the loudest synth-bass thunder he could muster. The set had begun reflectively with mingled acoustic-piano and Fender Rhodes lyricism, and built over Guiliana’s bass-drum barrages, hailstorm rimshots, and remarkable tonal variety at speed. Oceanic vintage-synth sounds washed over roaring low-end noise, then turned to a Ray Charlesian soul-blues theme. A typical Mehldau piece of sustained Bach-like modulation brought cheers, with Guiliana’s edgy energies behind it, and the encore became a headlong Joe Zawinul-like charge. But it was still pure Mehldau in its care for detail and its song-shapes, just with some loudly infectious histrionics piled on top.